Before I was married, I liked being out in the mountains on New Year’s Eve, dug into the snow up high, stepping out of the tent and looking at the stars in the winter sky, musing on the year just past, thinking about the year to come. I made lists in my mind of things I resolved to do, wrote them down when I was back at home, and referred to them throughout the months that followed. Jim’s favorite New Year’s Eve tradition, before we married, was more festive. It involved a gathering at a friend’s camp on a small pond. There would be music and a fire and skating. At midnight, they’d take down from its perch on a wall an unwieldy, 10-foot-long Swiss alpenhorn, throw open the door, and take turns trying to send a recognizable rendition of “Auld Lang Syne” out into the night air. One year, he remembers, coyotes in the surrounding hills answered back. As a couple with young children, ringing in the New Year has been a more domestic affair. This year, we’ll have just returned from a visit to family, so our celebration will be simple, and at home. Ursula and Virgil will no doubt insist on a game of Risk (a Christmas gift), which means that one of them may start 2012 as emperor of the world. Jim and I have been talking about spending part of the evening coming up with family resolutions: things we want to do individually and together, promises we want to make, and goals we’d like to reach. We’ve noticed that many of our ideas have to do with the outdoors. We’ve noticed, also, that the ideas fall into a few categories, and that thinking of the categories inspires us to come up with more ideas, whether they become resolutions or not. I thought I’d share the categories, and some of our ideas, here. Places we’d like to go. We keep a family list of places we’d like to travel to, or return to, tacked to the kitchen bulletin board. Some of these places are not in our current budget — I’m thinking of the moon, on Virgil’s list — but many are parks or natural areas. We’ll ask Ursula and Virgil each to pick one of these for family trips we’ll make in 2012. Will we visit Gettysburg? Yosemite? Acadia? Goals to motivate us. A neighbor tries to climb nearby Mount Cardigan at least 100 times each year. What if we climbed it 25 times as a family? Picked some number of 4,000 footers to climb in 2012? Made a family commitment to hike a certain number of miles on the Appalachian Trail? Even asking Ursula and Virgil about their outdoor goals should make for an interesting conversation. Changing daily behaviors. In the “if everyone lights just one little candle” vein, we want to consider the small things that add up, like leaving the car behind and walking to do our errands, buying fewer things, and turning off lights when we leave the room. If we lived closer to town, we’d add ‘walking or biking to school’ to that list. Putting these, and other small changes, on our list of resolutions will help us create new habits. Joining with others to help the environment. Ursula and Virgil are old enough to join a local group that maintains trails on Mount Cardigan several times a year. Other groups organize cleanups of nearby rivers and parks. Ursula may want to expand a school project, growing endangered lady slippers, or Virgil could translate his love of animals into helping protect wildlife habitat. May your New Year bring new outdoor adventures and new commitments to protecting our natural places and this beautiful big blue planet. 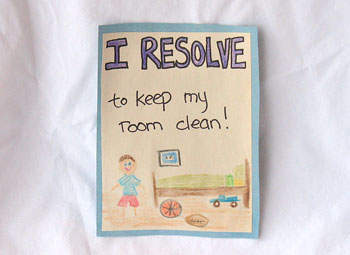 Learn how to make a “Resolution magnet” on Kaboose.com.